Graffiti Street Art found on garage doors and utility boxes in Toronto, Canada. These are photos taken of artwork that is usually done as a defensive measure against graffiti tagging. Artists generally get paid to do this art. 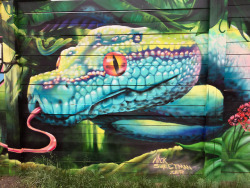 Most are hand painted or created with aerosol spray. 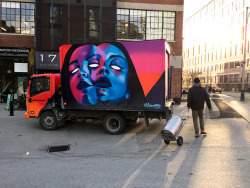 The city of Toronto has a program called ‘Outside the Box’ which allows artists to apply to create their work on a Traffic Signal box or even an electrical panel that an internet provider uses like Bell Canada. 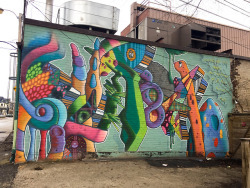 Garage door art (usually – found in back alleys) is again a defensive tactic done by home owners who don’t like when they have offensive graffiti ‘tags’ on their garages. When a mural is done on the garage door most of the time time a ‘tagger’ will not tag the mural. All of the street art photos were taken in the last two years. Again, because its a temporary medium – some of the art that appears may no longer be available for viewing since this photographs were taken.